Skunks can be an irresistible temptation to a dog, especially if they have never seen much small wildlife before. Unfortunately, just a brief run-in with a skunk can result in a miserable experience that can have effects for days. Scout wants to help you and your dog be prepared to get through skunk incidents as painlessly as possible. Here are a few things to keep in mind when dealing with skunky situations and tips on what to do to prevent and treat your dog when something happens. 1. Rinse irritated eyes with saline. 2. Wash your dog as quickly as possible. If you live in an area with small animals like skunks then you need to be especially careful about rabies. Make sure your dogs are always up to date on their vaccinations. If your dog gets scratched or bitten by a skunk, your vet may recommend a booster vaccine just to be safe, especially if there have been any outbreaks in your area. DO NOT LET YOUR DOG IN THE HOUSE OR YOUR CAR IF IT IS NOT 100% NECESSARY! This cannot be stressed enough. The odor from a skunk is overwhelming enough in outside conditions. If you allow your dog into your home or car then you are going to have more of a mess to clean up. Dogs often get sprayed directly on the head and that means the eyes get a big blast. Skunk spray is extremely irritating and can cause temporary blindness. The sooner you get eyes rinsed out the better. If you have an outside working dog then, unfortunately, you may not discover your dog has been skunked until they have been exposed to the spray for hours so eyes could be very irritated, red, itchy, and watering. You can use a special shampoo made for removing skunk odor or even Dawn dish soap if your dog is especially smelly. While I don’t recommend making it a habit using something that strips oils and grease off of hair like Dawn, in this case you want something that is going to cut through the stinky oils and residues your pooch is suffering from. Consider how much more spray a small dog is going to get on them in proportion to body size. A smaller dog may not tolerate the side effects as easily as a larger dog. If you have a smaller pooch and they seem to be having a lot of problems, you may want to get to the veterinarian. If your dog seems not to be able to see well after you rinse eyes and bathe them, then you need to monitor the situation. If they do not improve within 24 hours, then they should be checked out for eye damage. Although it is rare, if a dog gets a high concentration of skunk spray it can lead to convulsions. Do not give your dog water during this time even if they have skunk spray in their mouth. Keep them safe until convulsions stop and then get to the vet. Again, it is rare, but small earth dogs like terriers and dachshunds that can get back into skunk dens have been fatally poisoned when a skunk sprayed them in the small space. Skunk spray contains compounds that explode red blood cells, which can lead to anemia and also affect the kidneys. Dogs sprayed in close quarters should be immediately taken to the nearest emergency vet. It is natural for dogs to experience stomach upset and nausea after being sprayed by a skunk. If it is excessive, you may want just to feed water and electrolytes for 12-24 hours. If it doesn’t stop then head to the vet. 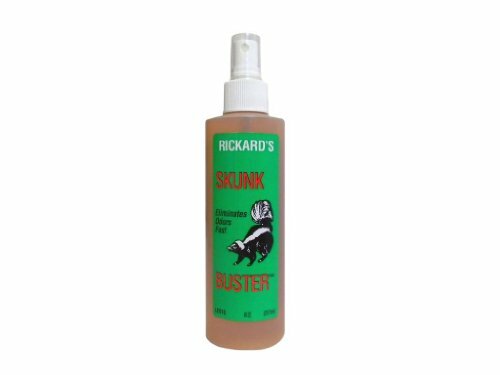 This little bottle of spray works wonders on dogs and you can use it as a detergent to wash clothes and other items that have been contaminated with skunk scent. Simply spray on affected areas of your dog and let it set. Be careful to not spray near the eyes or too close to the nose. You can also apply with a towel if spraying makes your dog uncomfortable or you need to get to sensitive areas. We have a lot of hunters around where I live and this is what they have at the hunting supply store to use on their dogs. Some dogs are very stubborn about animals that cross them. Our oldest Great Pyrenees, Ruby Pearl, has been sprayed at least 4 times by skunks. Her situation is unique because most dogs learn to stay away from skunks after the first time. Not Ruby. After the first time she got sprayed between the eyes she actually seemed to start hunting them. The worst incidents were when it was clear she had grabbed hold and shook the skunk trying to kill it. We used the Skunk Buster product mentioned at the beginning of this post as well as baking soda and that managed to get her through all of these terrible incidents. I am thankful that this doesn’t happen anymore. The once high skunk population is no more since we cleared the property and now that the dogs run around on it a lot. Part of the problem when a dog gets skunked is that by the time you notice the next morning, your other dogs and cats have had the opportunity to rub on the dog that was sprayed and then you have multiple animals that are stinky and certainly not allowed in the house! 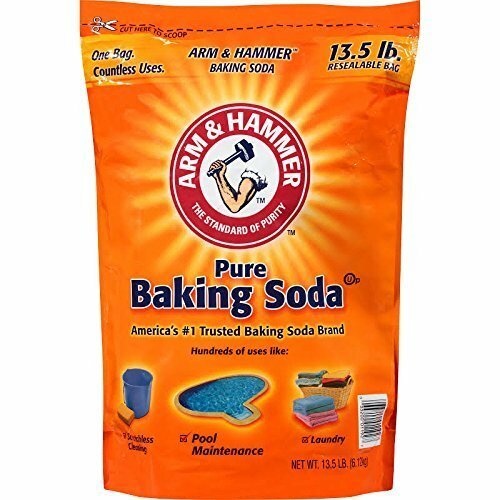 Every household should have a giant bag of baking soda because it is useful for so many things. Washing and wiping down your dog after they get skunked is one of the uses. To do this just make a solution of baking soda and water, then dip paper towel in it and use it to wipe off some residue. This is also great for rinsing dogs after you have bathed them with shampoo to remove the initial odor. I like to do it as a pre-treatment so that the rest of what needs to be done is bearable if it is a particularly bad skunking. Sometimes you get lucky and they only get a little bit of spray on their head and you can eliminate some of it really quick. I recommend buying your baking soda in very large bags. It is more economical by far and it ensures that you always have a good supply on hand for cleaning up all kinds of messes. From deodorizing carpets to cleaning up a skunked dog, do yourself a favor and get the big bag. Never let the clothes you or your family member are wearing sit in the laundry basket if you have been around a skunky dog. The odor will stay and infiltrate your home. Immediately wash or put in plastic bags and leave outside your house until you can wash them. You do not want to hang on to any dog towels or scrubbers after a skunking. It is not worth the trouble to try to save them for later. They will be very smelly and not usable. If you are using some fancy scrubber or brush you want to keep then immediately spray them down with an odor absorbing cleaner. This is a fantastic deal for a heavy duty odor remover. You may want to keep a container of this around just in case. The lavender scent offers a refreshing aroma. This is safe to use on clothing, carpets, and pets. This product gets rid of the smell fast! Reviewers rave about how the skunk smell is gone in minutes even on a very large dog! The liquid enzymes work fast to naturally eliminate odors instead of just covering them up. This easy to apply spray liquid is the companion product to the shampoo below. 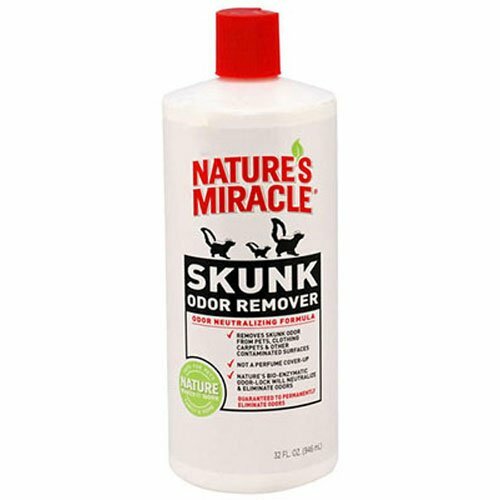 It can be nice to have for spraying down any areas where your smelly dog has been before getting treated for being skunked. This quart-sized spray goes a long way and gets a lot of raving reviews from dog parents. This special shampoo will gently yet effectively remove odors from your dog. This shampoo can be used on puppies eight weeks and older and has a budget-friendly price tag. You can also wash clothing and other fabrics with it to remove any lingering odors. It contains essential oils and doesn’t dry out sensitive skin. There are no enzymes in this one and it doesn’t just mask odors. If your dog gets a lot of stinky spray on them you may have to wash twice. Fencing that doesn’t have holes that are small enough for skunks to get through can help. Skunks do like to dig so they might be determined enough to try it but a lot of the time they just move on to an easier place to get around and live. Allowing your dog out in a kennel rather than allowing them to run loose at night can also help. Skunks like to find places that have good coverage and make dens. Big piles of debris and bramble can encourage skunks to make their home with you and your animals! Skunks don’t like the smell of citrus fruits so you can use citrus sprays, plant citrus if you live in the right climate, or save your peelings and scatter them in areas around your property. Skunks are like any other small animal in that they love a free meal. Leaving food out is inviting them into your space and you waste food that could be used for your dog. Bird feeders can be another source of food for skunks so make sure that you clean up bird seed spills and put feeders up in a way that skunks cannot get to them. Some breeds of dogs are more likely to go back in dens. While rat terriers, Jack Russell Terriers, Dachshunds, Scotties, and more are great for keeping things run off, you don’t want them getting a blast while in a confined space. Until the skunk situation gets under control, use extra caution to prevent a very painful or fatal experience. While I know that there is some scary stuff in this post, the good news is that most dogs recover from getting skunked very fast and there is no lasting harm. At the same time pet parent’s need to be aware that not all dogs are the same and some dogs can be more sensitive or have other health issues that make it harder for them to recover from things. Dogs can sense if you are very upset and it can cause them further stress. Staying calm is going to be better for not just you but your dog.